The Sentry Safe DCB-1 Deluxe Safebox with Key Lock is a great solution to organize and secure your cash and valuables. For more than 80 years Sentry Safe has been crafting top of the line security units. While redefining protection for the things you value the most. With a wide variety of high quality safe and safe box models, this company has proven that it puts security first. They understand the potential for disaster, making them the premier choice for your security needs. This cash box features a simple to use privacy key lock. It has a durable and reliable steel exterior measuring 3 9/16″ high by 11 13/16″ wide and 9 ¼” deep. Making it the perfect size to be easily concealed. This includes a night stand or desk drawer, in the top of a closet, or beneath the seat of your vehicle. The fold away handle and durable black enamel finish gives the safe box a smooth and sleek appearance. Weighing a mere 5 lbs, this safe box is the perfect security solution. Which offers the utmost in portability. While easily carried from one destination to the next. All Sentry Safe keys do come in sets of two and are numbered. If keys are lost replacements can be ordered using the product information. Requiring a authorized statement of ownership to ensure only authorized users are able to acquire keys. The Sentry Safe DCB-1 is designed for easy and versatile organization. The interior of this model offers .21 cubic feet of storage that can comfortably hold letter sized papers. With plenty of room for items such as spare money, checks, receipts and more. 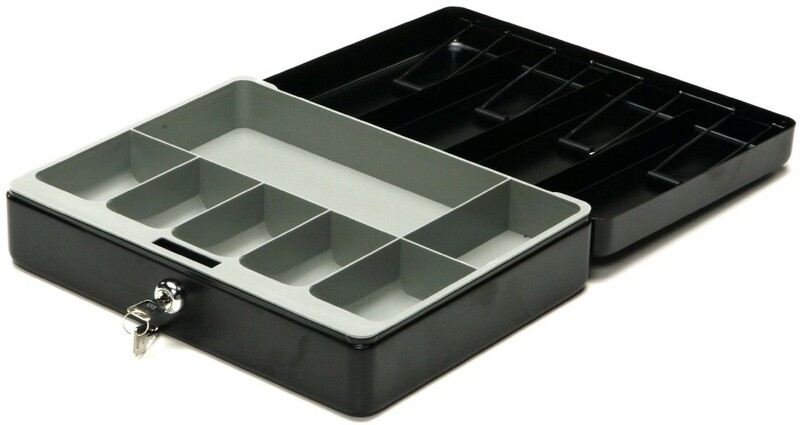 It also features a 7 slot removable tray made of sturdy plastic and 4 spring loaded money clips on the lid to keep both bills and change organized. This is the perfect high quality safe box for things such as garage sales or fund raisers. Also it can be used by treasurers or small businesses. Some people stated that the bill clips could be sturdier in order to hold more bills. And the fact that the lid does not include a latch and must be locked in order to secure the lid on the particular model safe box they chose. The scooped design of the slots make for easy removal of change, paperclips, tacks, or anything you choose to secure inside the safe box. This unit is the perfect affordable security solution for any home or office. This high quality safe box offers incredible storage and organization. As well as security and portability at an incredible value. With its versatility and ability to easily be concealed, this is the perfect investment for any home or small business. And with a name brand like Sentry Safe, you know the DCB-1 is a great investment.